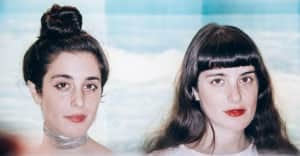 Tonight sister duo Sari and Romy Lightman, who perform a pretty and mystical sort of folk-rock as Tasseomancy, will join BRAIDS for a month on the road (see dates below). But before they kick off, they have shared a warm and surreal visual for their first single "Braid. Wind Is Coming." Shot on Super 8 by the girls good friend and director Blake Blakely, the video has an air of intimacy and a special back story. As Blakely told The FADER, it was shot in the spell following his Leukaemia diagnosis. "When my health allowed, Tasseomancy and I would meet up in my neighborhood, or at my house and shoot a couple rolls of film on my sisters Super 8," he said. "When I had less energy I would stay at home and piece together the animation. Gradually, this video emerged." "This video became a kind of companion—a point of connection to a world I felt separated from," he added. And "In the end, it became about taking stock of what was around us and trying to finds some beauty in it. My hope is that this video captures some of the ernest love we all had for the project and documents the tight friendship that grew between myself and the band." Watch above, then take a second to take stock in the beauty around you.